We've got our workshop coming up in a few weeks, and we'll be providing weighting in cars (for those that want it) from 3/8" lead wire. What I'd like to do is, prior to the workshop, send out an example of a reasonably fast car template, using the provided weighting. The car would be 1/2" thick at the rear and we are allowed to move the axle holes (that's another thing we'll offer at the workshop). This seems like the most advantageous compromise between aero and weight placement that I can come up with, but I thought I'd collect thoughts from you guys and see if anybody else might suggest different placement. So, I started building a test car, to see how it would turn out. The car is 1/2" tall, with 4 holes for weights. (I expect the 4th hole to be only partially filled). Started with a block of basswood (I'll have to repeat with pine, but I don't expect too much difference). It's pretty critical to drill out the weight holes BEFORE cutting the body. I marked the centers with a tap-die, then drilled starter holes, then did the final drill with my cheap HF drill press. 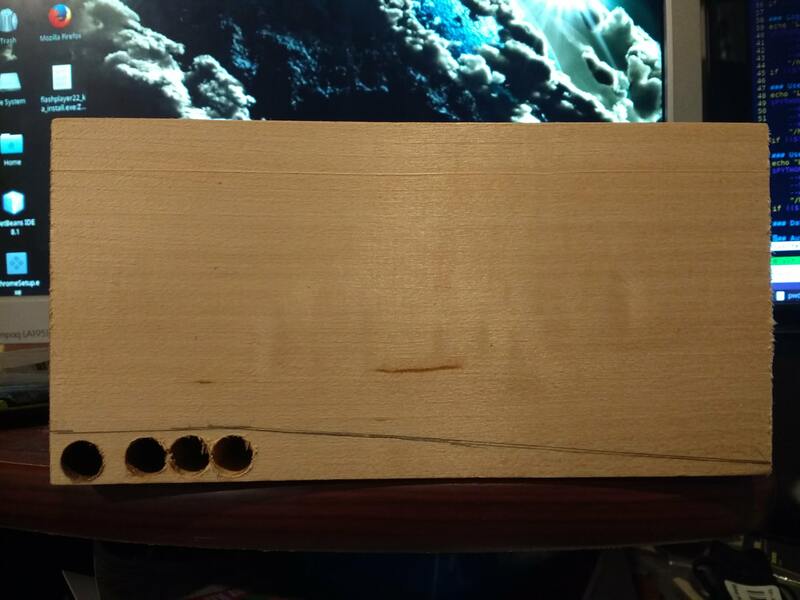 Even with the press, you can see the holes aren't entirely perfectly aligned. This concerns me a bit, because we'll have a lot of holes to drill at the workshop. I may make the body a little taller...perhaps 5/8" of an inch to give a little more room for error. 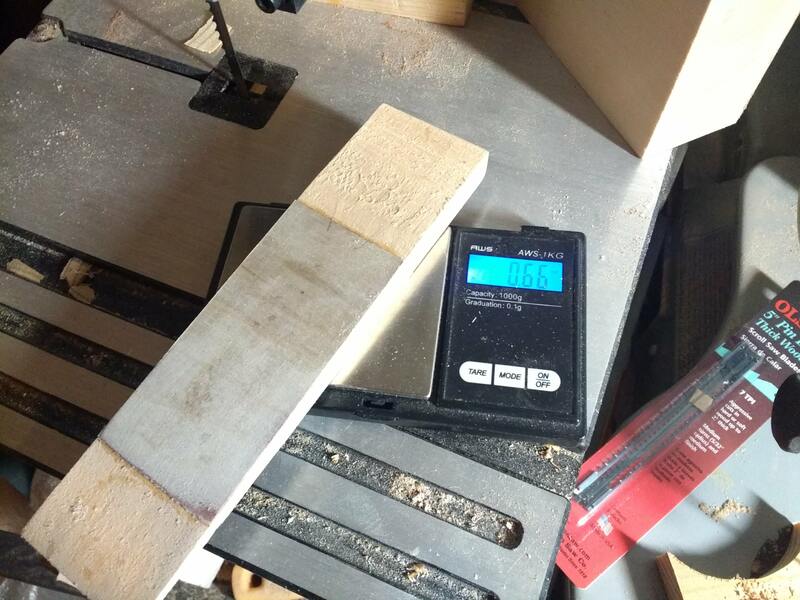 Next, I cut out the shape on the bandsaw (easy enough) and threw it on the scale to see what it weighed. Not too shabby, but we can get lighter than that! Went to the trusty scrollsaw and did some material removal. Looks kind of like Stan's "Rail Car" now, eh? Took off a good bit of weight that unnecessary wood. I suppose I could have covered the voids with tape or a label, but I wanted this to be a "wooden" car, so I bonded two pieces of thin 1/64" plywood over the voids. Added a little weight, but not too bad. The next step will be to insert the lead wire and see how I do on the CoG. If I get a good repeatable build, I'll write up instructions for folks wanting to emulate this design at our workshop. So I went ahead and cut some lead wire and filled up the weight holes. I weighted the car to 4.9 oz (to accommodate a bit of paint/etc). At a 5" wheelbase, I got a COM of about .84" in front of the rear axle. That's not too shabby for a scout car, I suppose! If somebody wanted to, they could use the same design and employ tungsten rounds instead of lead wire to improve the COM. Tungsten plates below might also be an option. The very last drilled weight pocket in the end of the car.. could you change up your COG even more by drilling it a little bit higher up from the bottom of the car body? I have seen some larger car designs where the last weight pocket in the end of the car is drilled a little higher up from the bottom. Hmmm. Not sure I follow. How would moving the weight higher improve the CoG? I have been in contact with Vitamin K and I understand what he's trying to do. I applaud him for it. A 3/8" X 1 1/2" piece of lead wire weighs about 1.02 ounces. 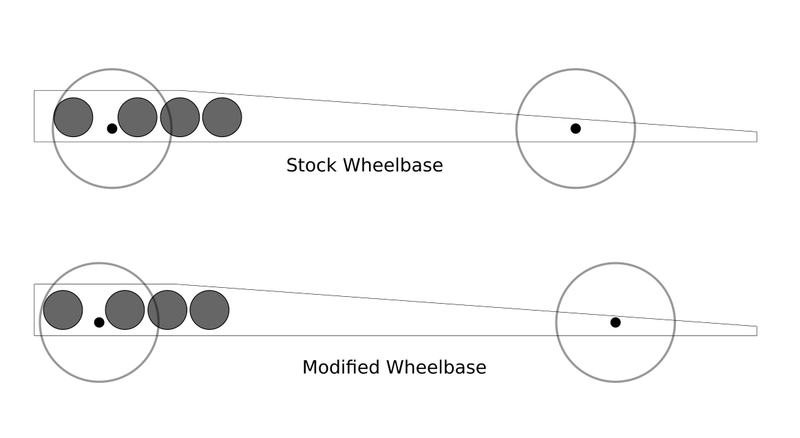 It is recommended to have 1 1/2 ounces behind the rear axle slot and some are recommending 2 ounces behind the rear axle slot on a stock wheelbase car. Lead 3/8" wire is not dense enough to give you everything you want in this model car but it is cheap. Using all lead, a flat piece of lead from Bass Pro shop over the last hole would give more what is needed and the back of the car could be cut accordingly. That would cause more work and now I'm Off Topic. Keep up the good work, Vitamin K. That car is starting with science and can be made to go very, very Fast. I asked about moving the last weight pocket hole higher up in the design..
And with what Speedster said I applaud him for talking about the 3/8 lead weight & getting more weight behind the back axle. 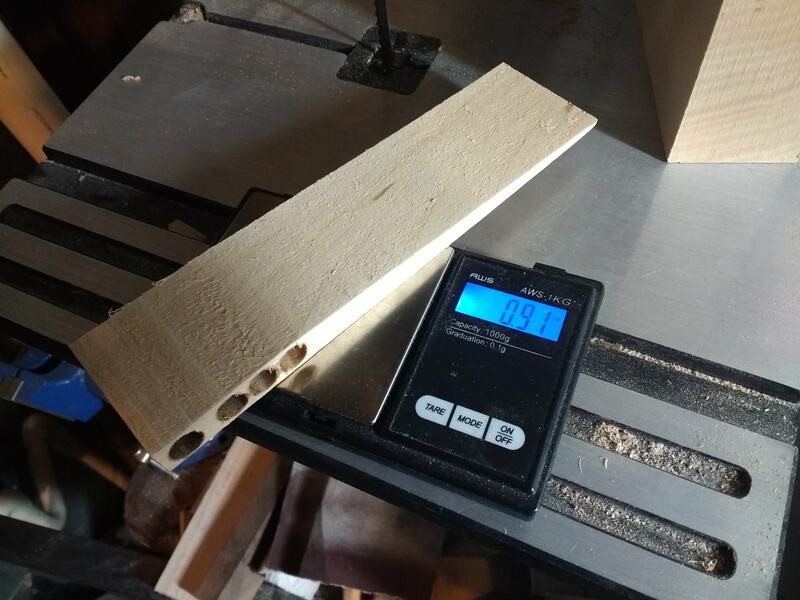 Even though there is not much room to work with in this 1/2" thick car design every little bit of weight you can get placed just right in this design. And that's why I asked about moving the last weight pocket hole up in the design. I was wrong. I thought my friend told me the lead came from Bass Pro Shop. It is not lead. It is steel. VK, you said you filled up the holes. That should amount to about 4 ounces. How deep are those holes? They're drilled deep enough to accomodate a 1.5" length of wire. I drill down as far as I can go without breaking through the wood on the other end. When I sent it out to Pack parents, I dubbed it the "Speedwedge", but "Door Stop Rocket" works for me! I Thought you might like the name the door stop rocket VK! Here's that link I seen that shows a different car design.. with the last weight pocket hole drilled a little higher up in the design. Note how many weight pockets the builder drills for his weight type as well. Actually, the wedge I have already has enough wood under the last hole that can be removed and the 1 ounce plate will stick on the car with its own adhesive. VK's last hole would need to go up only about 1/8" for the weight to be level with the bottom of the car. However, I would stick with the lead, stock wheelbase, and don't cut any additional wood from the car. If you get enough scouts choosing this design you'll find they are all fast and they will all run in a Pack. That gets exciting. I did this 2 years ago with 24 children, not related to scouting. Went pretty well, all told! I guess we had something like 35 cars or so come through the workshop? 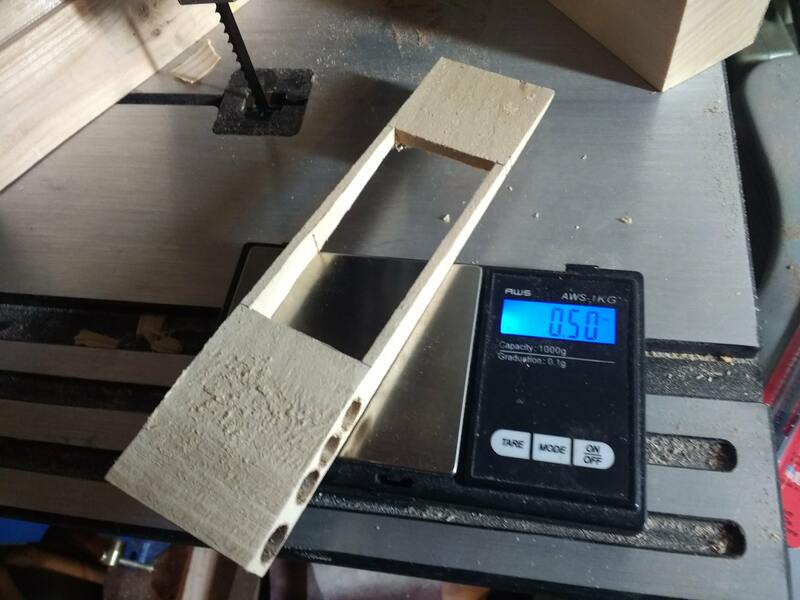 We'd look over their design, make any necessary suggestions or modifications, then drill out the weight pockets, drill the axle holes, cut the profile on the bandsaw and, if necessary, do detail cuts with the scroll saw. For the axle holes, we used the clear jig by Microbrush. Worked great. I really recommend the tool. The one area that we ran into trouble with was getting the cars weighted, beccause we ended up being shorthanded. So instead of getting the cars weighted out at the workshop, I ended up taking them home and inserting weight myself. Overall, though, I'd say it was successful. Last edited by Vitamin K on Mon Apr 02, 2018 1:14 pm, edited 2 times in total.